this is an awesome job with the HOUSE WORK Acrostic it expands on he subject and the lines continue as one single thought this is Da Bomb! I truly find your words quite interesting. I will follow your blog faithfully! I like you words! After the laundry. Everything else can wait. 🙂 I know how you cats love to snuggle in the warm laundry! I knew I really liked you!!! This was wonderful!! Sign me up!! 🙂 Consider yourself signed up..now get out of the house and do something! Thank you, you awesome thing you! Housework… is why I drink. Great acrostics! LOL 🙂 Glad you liked it! I can’t get any housework done at the moment due to the new kitten demanding constant attention. Herstorically, women have been given the job of housework to keep us out of politics and to stop us from taking over the world. i think we’ve done enough. Lets bring dirty laundry to Washington and dump it at the government’s door, WHERE IT BELONGS. Then we can meet for lunch and begging plotting for the take over. Bring your notes. 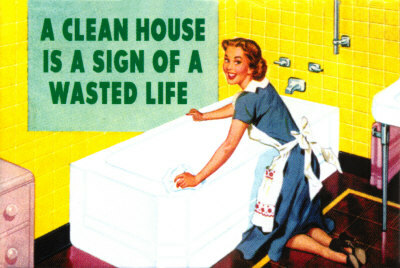 I have become a housework fanatic. Basically because when my boys are at their dad’s, I need something to do to take my mind off of the fact I have no one to spend time with and the guy I truly love more than anything else in the world is with another woman.